I'm getting them done as fast as I can...these babies...they just keep coming. And coming EARLY. This is Apple Cobbler, by Carlene Westberg Designs. I got the pattern as a PDF download, from Fat Quarter Shop. 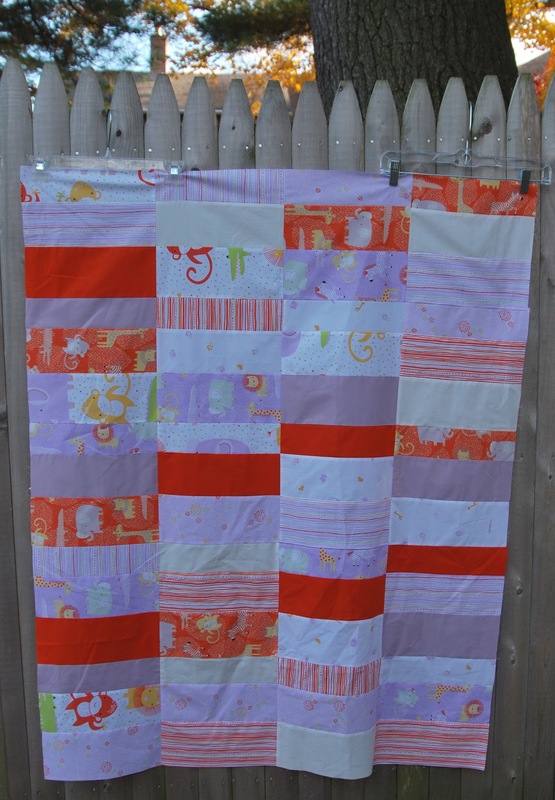 The fabric I used was a fat quarter bundle of Safari Sweet by Alysssa Thomas (Penquin & Fish). This is from Clothworks' Organic Elements line. One side note...I do find the organic fabrics a bit stiffer to sew with, but they wash just beautifully and come out very soft. Funny, it seems if I wash it first, then sew on it, it's still pretty stiff...but the end result is always soft, and I'm pleased with it. The pattern was super simple. You cut three size rectangles from fat quarters. My only beef was that it said "works well with large and small scale prints". I didn't really think about the fact that I had stripes, and that they may need to get cut in two different directions out of the fat quarter. It would have been nice if that was noted, but that having been said, I think the mix and match of the stripe directions actually looks really cute. 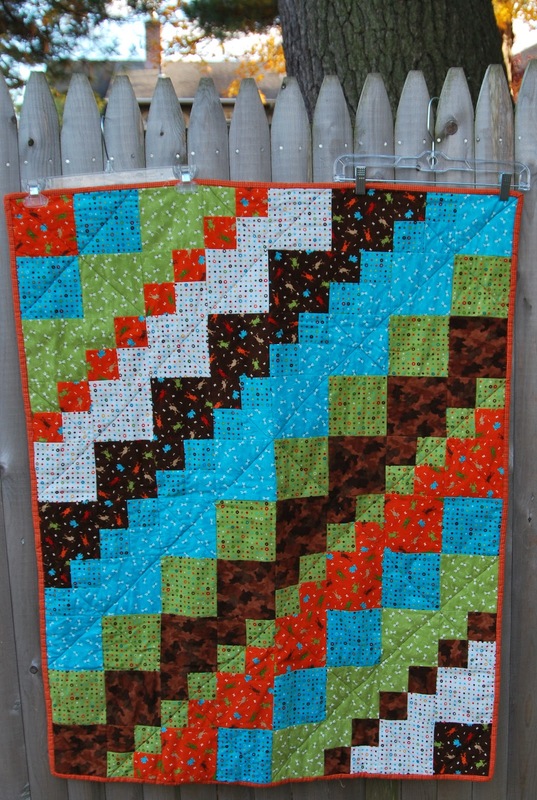 I also quilted and bound my second Square Dance quilt. I used a cotton from the same line, and an orange houndstooth (Denyse Schmidt) for the binding. I am over the moon with the results. This may become my go-to baby quilt pattern. I love the brightness of the blue for the back, and blue and orange are one of my favorite color combinations. Look at all those critters! Dragonflies, ladybugs, turtles, salamanders...just perfect for little eyes to focus on. Next up is a big reveal for me...I have been working on these two projects for over a year. It will be a big exciting day for me, and I can't wait to share it with you all. 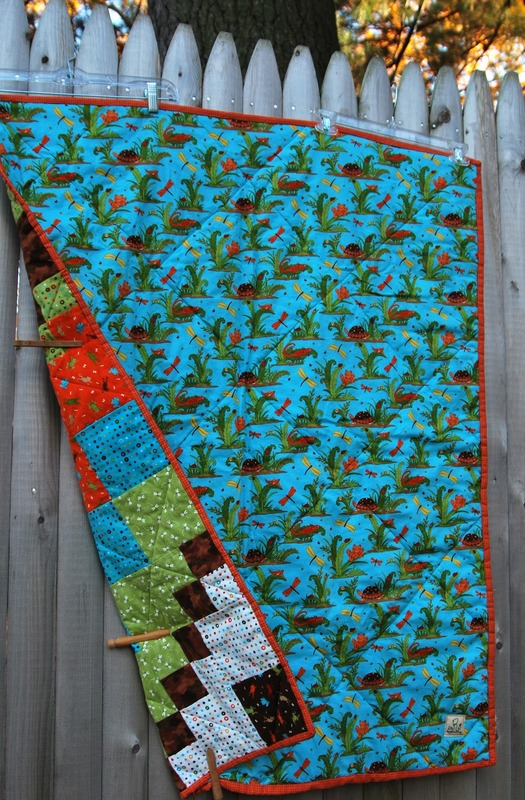 My first two quilt patterns - where to find them!